Gastroenterology and Hepatology Unit, The Canberra Hospital, Australian National University Medical School, Garran, Australia. Non-alcoholic fatty liver disease (NAFLD) is the commonest form of liver disease in all regions of the world with modern industrialised economies, including Korea and many other Asian countries.1-6 Patients usually present without symptoms or clinical features are non-specific. Instead, liver abnormalities are found incidentally by hepatic imaging, particularly ultrasonography, and/or there are raised liver enzymes (alanine aminotransferase [ALT] and gamma-glutamyltranspeptidase).7-9 The diagnosis of NAFLD requires exclusion of other disorders, particularly viral hepatitis, significant alcohol intake, and exposure to potentially hepatotoxic medications. By agreements such as the Asia-Pacific Guidelines on NAFLD,6 the term NAFLD is now retained for cases of fatty liver associated with metabolic complications of over-nutrition, usually with central obesity and overweight. The known ethnic differences in metabolic complications of over-nutrition, such as insulin resistance, diabetes, metabolic syndrome and hypoadiponectinemia, are also consistent with the proposition that, like them, NAFLD is a genetic disorder.3,18,19 Thus, an encompassing concept for NAFLD pathogenesis is that it represents the outcome of genetically determined interactions between a changing environment and a susceptible host. In this case, the environmental factors include too much energy intake, particularly in the form of cheap, highly processed simple carbohydrates and saturated fats, and reduced levels of physical fitness resulting from sedentary lifestyles.20,21 Of particular interest to the present review, one prevalent genetic polymorphism predisposing to steatosis in overweight persons of European or Hispanic ancestry, PNPLA3, does not operate by increasing the risks of diabetes or metabolic syndrome.18,22-25 Instead, it correlates with serum ALT levels,26 reflecting liver injury or inflammation, and with more severely fibrotic liver disease in both NAFLD/non-alcoholic steatohepatitis (NASH) and alcoholic cirrhosis.27,28 This point emphasises that not all cases of NAFLD have the same implications for liver disease. NAFLD embraces a pathological spectrum of liver disease, from cases of steatosis with virtually no evidence of hepatocellular injury or liver inflammation, often referred to as simple steatosis or "not NASH," through steatohepatitis (NASH), to cases with cirrhosis.29-31 The latter are often complicated by portal hypertension and hepatic decompensation, and occasionally present with hepatocellular carcinoma (HCC).32 At this late stage, steatosis and liver inflammation may both have resolved; they are cases of "cryptogenic cirrhosis." As discussed next, natural history and clinical outcome studies based on community and liver clinic cohorts indicate a nearly 2-fold increase in standardized mortality rates among persons with NAFLD.33-37 Further, while cardiovascular disease and common cancers remain the two most common causes of death, liver-related mortality ranks the third most common, as compared to 13th in the general community.36 A key question emerges: what aspects of liver pathology, and what disease mechanisms, account for progression of NAFLD to cirrhosis and its fatal complications? A common outcome of the above subcellular stress processes is the activation of intracellular pathways that signal proinflammatory responses. These signalling pathways include ionic calcium, protein kinase and transcription factor activation, and the most consistent are activation of NF-κB and JNK. These pathways will now be considered separately, but it should be noted that they are usually activated in tandem and often coregulate the same gene products. Second, in patients with only hepatic steatosis there can be changes in host characteristics over time, such as increasing body weight or worsening insulin resistance and/or development of diabetes, and baseline steatosis and necroinflammatory severity have not been correlated with such progression of metabolic disease.12,34 These considerations not withstanding, most gastroenterologists and hepatologist would generally reassure patients with isolated hepatic steatosis about their liver prognosis, but recommend primary care follow-up of cardiovascular risk factors and lifestyle interventions to address these. Conversely patients with advanced hepatic fibrosis should enter a more rigorous liver follow-up protocol. In summary, the combination of hepatic fat and lobular inflammation is now regarded as insufficient for a diagnosis of NASH. However, other features such as the presence of "more than mild" portal inflammation,29,33 or the presence of panacinar steatosis (as compared to isolated zone 3 steatosis),48 have also been associated with advanced hepatic fibrosis. The latter is the best histologic predictor of liver-related mortality irrespective of the degree of steatohepatitis.49 As expected from the earlier discussion, classification systems incorporating hepatic fibrosis in the definition of NASH correlate well with liver-related mortality,33,47 while systems that do not are not predictive of future outcome.29,30 It needs to be stated, however, that the latter systems do include staging for hepatic fibrosis, but do not require its presence for the definition of NASH. Having established that fibrotic NASH is all that matters, is there any value in assessing the degree of necroinflammatory activity? It would be if it could be determined that the grade of inflammation is a predictor of future hepatic fibrosis (in the case of liver outcomes) or metabolic syndrome-related disorders (in the case of overall mortality). Some evidence supports this view,50 although negative studies have also been reported.12 A systematic review showed clearly that age and inflammation on the initial biopsy (hazard ratio, 2.5) were the main independent risk factors for fibrosis progression.51 These findings are not surprising because clinicians are familiar with the need to 'damp down' hepatic inflammation in chronic viral hepatitis B or C and autoimmune hepatitis in order to achieve a favourable clinical outcome by preventing or reversing progression of hepatic fibrosis. After establishing that NASH is the hepatic component of the metabolic (insulin resistance) syndrome,2,3,52,53 it was to be anticipated that morbidity and mortality from cardiovascular disease would be highlighted in long-term studies of NAFLD. Surrogate markers of atherosclerosis (e.g., carotid intima-media thickness) are present even in adolescents with NAFLD, and clinical endpoints such as deaths from myocardial infarction/need for coronary revascularisation have been documented in several natural history studies of NAFLD.36,37 The concept that fatty liver may also drive the inflammatory cascade of atherosclerosis is now gaining acceptance. There is some evidence that individuals with NASH have a worse atherogenic profile,54 and are more likely to have overt cardiovascular disease than patients with hepatic steatosis alone.12 In summary, based on present somewhat limited evidence, it can be concluded that ongoing hepatic necroinflammatory activity in patients with NAFLD increases the risk of future cardiovascular disease, and confers a higher risk of unfavourable liver-related outcomes by promoting development of hepatic fibrosis. Other SectionsAbstractINTRODUCTIONWHICH ASPECTS OF NAFLD PATHOLOGY HAVE PROGNOSTIC AND MANAGEMENT IMPLICATIONSWHAT ARE THE ORIGINS OF LIVER INFLAMMATION IN NASH?LIVER CELL TYPES AND INFLAMMATION IN NASHHEPATOCYTE STRESSESPRO-INFLAMMATORY SIGNALSINNATE IMMUNITY IN NAFLD: TLRS, KCS AND LYMPHOCYTESFUTURE DIRECTIONS, CLINICAL AND THERAPEUTIC IMPLICATIONSFiguresTablesReferences WHAT ARE THE ORIGINS OF LIVER INFLAMMATION IN NASH? Inflammation is a critical response to tissue damage or infection in which secreted mediators such as cytokines, chemokines and eicosanoids coordinate cellular defences and tissue repair. Since this is generally a whole body response, it is possible that inflammation affecting or infiltrating the liver in NASH may originate outside the liver. One site of interest is the adipose, particularly visceral adipose which is expanded in NAFLD.3,55,56 Visceral adipose is inherently pro-inflammatory,57-59 but inflammation also occurs in stressed, de-differentiated subcutaneous adipose tissue in obesity. 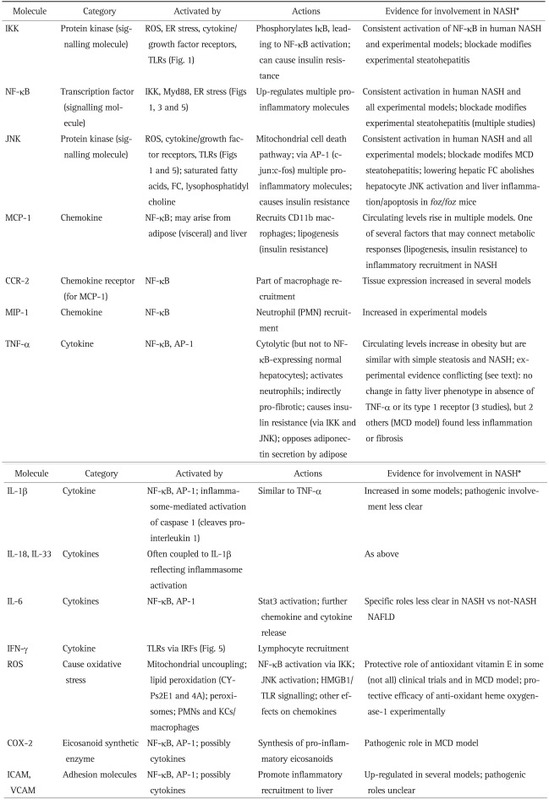 Important consequences include the release of macrophage chemokines and cytokines, notably macrophage chemotactic protein 1 (MCP-1) and tumor necrosis factor-α (TNF-α). A recent time course study showed that in mice fed a high fat (HF), cholesterol-enriched diet, macrophage and cytokine transcripts were up-regulated in adipose at 6-16 weeks, before their appearance in liver from 16 to 26 weeks.60 Key inflammatory signals, including interleukin (IL)-1β, IL-1 receptor antagonist, TNF-α and CD11b+ and CD11c+ macrophages, were particularly associated with liver inflammation. Lanthier et al.61 have likewise shown that macrophage inflammation of adipose is responsible for the early stages of both hepatic and peripheral insulin resistance in HF-fed mice, but deletion of adipose macrophages cannot reverse the later phase once liver inflammation is established. In other research, a consistent increase in serum MCP-1 has been noted to be part of the systemic and adipose inflammatory state in metabolic syndrome.62-67 Adipocyte-derived MCP-1 (also known as CCL-2) stimulates recruitment of chemokine (C-C motif) receptor 2 (CCR-2)-expressing macrophages into adipose. MCP-1 and its cognate receptor, CCR2, are potentially important molecules in NASH since, like NF-κB and c-Jun N-terminal kinase (JNK), they unite the inflammatory response with insulin resistance,68,69 as reviewed by Maher et al.70 and depicted in Fig. 1. MCP-1 also stimulates lipogenesis in the liver.71 In this way, adipose inflammation can exacerbate steatosis and connect to innate inflammatory responses within the liver. Another tissue compartment that could contribute to liver inflammation in NASH is the gastrointestinal tract, more specifically, the gut microbiota. There is evidence of altered gut flora in obesity,77 and of increased mucosal permeability in NASH.77-80 Further, in some animal models sterilisation of gut contents or their modification by probiotic administration to suppress endotoxin production altered liver inflammation or liver injury,81 albeit the models do not conform to what we now categorize as NASH. The topic of intestinal-liver interactions in obesity and fatty liver disease has been reviewed elsewhere,70,80,82,83 and will be mentioned later in respect to activation of innate immunity in the liver. Notwithstanding the potential relevance of adipose inflammation,84 circulating chemokines, cytokines and inflammatory cells, and the gut microbiota to NASH pathogenesis, the perspective we will take in this review is that one may not need to look much further than at the liver itself to understand the origins of inflammation in NASH. Several possible mechanisms activate pro-inflammatory pathways in livers with NASH, leading to release of chemokines, cytokines and other pro-inflammatory molecules, as summarised in Table 1. Chemokine release is particularly responsible for recruitment of infiltrating monocyte-derived macrophages, and neutrophils, which together with lymphocytes comprise the mixed cell type inflammatory infiltrate in NASH. Oxidative stress and necrosis can provoke a neutrophil inflammatory response.87 In general, pro-inflammatory signalling in NASH is mediated by activation of innate immune mechanisms. These may be primed by gut-derived endotoxin, but there is increasing evidence that this is in response to lipotoxicity and/or molecules released by stressed hepatocytes (discussed below). The appearance of simple steatosis in the majority of cases indicates that fatty livers are not necessarily pro-inflammatory. However, it now seems likely that the steatotic hepatocytes in NASH contain excess lipid molecules other than TG, and there is mounting evidence that such non-TG lipid molecules are implicated in the pathogenesis of NASH by the process of lipotoxicity.3,88-92 Conversely, formation of TG may actually be a cytoprotective mechanism in liver.89,90 Candidate lipotoxic molecules in NASH have been reviewed;90,92,93 they are summarized in Table 2. 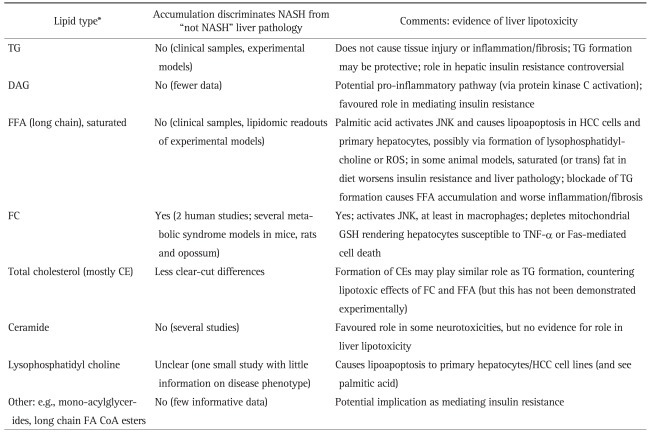 Some potential lipotoxic lipid species implicated in NASH have been explored experimentally, particularly saturated FFA and FC, but also (mostly in dietary studies) PUFA,97,98 sucrose,99 and fructose.100 Such studies demonstrate the unequivocal potential of such lipid molecules to kill cells of hepatocyte lineage, by directly or indirectly activating JNK and the mitochondrial/lysosomal cell death pathway,101 and also to stimulate pro-inflammatory signalling via NF-κB and JNK/activator protein 1 (AP-1), as discussed later. In general, saturated long chain fatty acids (such as palmitic and stearic acids) are more toxic than mono-unsaturated FFA.102-105 There are also data that the effects of palmitic acid may be exerted via formation of lysophosphatidylcholine,95,106 or via reactive oxygen species (ROS),107 or endoplasmic reticulum (ER) stress.105 To date, however, most such studies have been in immortalised cell lines (typically human HCC cells) whose biology differs from well-differentiated hepatocytes and the intact liver (Table 2). In HF-fed foz/foz mice, onset of NASH is associated with more than 200-fold increase in liver cholesterol esters (CE), and ~8-fold increase in FC.115 Removal of cholesterol from the HF diet reduces hepatic CE and FC content and ameliorates the severity of liver injury and steatohepatitis.115 Likewise, pharmacological treatments that lowered hepatic cholesterol dampened necroinflammatory severity in this NASH model.123 Conversely, increasing dietary cholesterol (to 2% in foz/foz mice,115 or 1% in other studies with C57B6 mice108-121) worsens inflammation and liver injury in experimental NASH. It is plausible that FC or other cholesterol fractions (7-ketocholesterol and other oxysterols are candidates) could activate KCs and recruited macrophages directly, analogous to processes implicated in atheroma,112,113,124 and demonstrated in low density lipoprotein receptor knockout and apoE knock-in mice.125,126 However, immunofluorescence studies in foz/foz mice (unpublished data) and human livers94 show that hepatocytes are the cell type most conspicuously laden with FC in NASH. The subcellular compartments involved are the plasma membrane, ER and mitochondria.94,115 A noteworthy feature of our studies has been the location of macrophages and neutrophils around heavily lipid-laden and swollen hepatocytes, some of which are ballooned (Fig. 2). Cellular processes could lead hepatocytes to incite inflammatory recruitment in NASH are discussed next. Oxidative stress is a key pro-inflammatory pathway in acute liver injury, such as ischemia-reperfusion injury87 and in some types of steatohepatitis,134 including alcohol-related liver disease, methionine deficiency,138 and methionine and choline deficient (MCD).137,139-142 Older studies employing immunohistochemistry demonstrated evidence of oxidized proteins, lipids and DNA in NASH livers,143-145 but this could be a consequence of inflammation rather than its cause. A potential distraction has been identification of multiple sources of pro-oxidants in NASH, such as mitochondria (from uncoupling of oxidative phosphorylation to release reactive oxygen species), from ER (induction of cytochromes P450 [CYP] 2E1 and 4A),146,147 peroxisomes89 and inflammatory cells (NADPH oxidase).134,148,149 Hepatoprotection from anti-oxidants and anti-oxidant pathways (such as heme oxygenase) has been demonstrated in MCD steatohepatitis,150,151 and vitamin E may have some efficacy against necro-inflammatory change in NASH,152 but there is less evidence for operation of oxidative stress in murine models that link metabolic syndrome to NASH. We agree with the interim conclusion reached by several experts,89,91 that oxidative stress and/or cytokines are not likely to be the initiators of liver inflammation in NASH, although roles in insulin resistance, perpetuation of necroinflammatory change, fibrogenesis and progression towards cirrhosis and hepatocarcinogenesis remain likely. Accumulation of unfolded proteins within the ER is often observed in cells like hepatocytes that have high rates of protein synthesis. The cellular responses, collectively known as the unfolded protein response (UPR), involve provision of chaperones, such as 78 kDa glucose-regulated protein (GRP78), for protein refolding and transport out of the ER, and suppression of further protein synthesis.153-155 Failure to mount an adequate UPR triggers a set of intracellular molecular "switches" that comprise the ER stress response. The three key pathways are depicted in Fig. 3. Through these pathways, ER stress activates NF-κB, JNK and C/EBP, with downstream effects on inflammatory recruitment, phosphorylation of insulin receptor signalling intermediates (to worsen insulin resistance), lipogenesis, and oxidative stress. These processes can ultimately lead to dismantling of the cell by apoptosis, particularly involving C/EBP-homologous protein, which transcriptionally suppresses anti-apoptotic Bcl-2 and induces pro-apoptotic Bim (Fig. 3). Relationships between hepatic ER stress, lipogenesis, insulin resistance and hepatic steatosis in obesity and metabolic syndrome have been the subject of intense scrutiny,155,156 and ER stress has been proposed as a mechanism in diverse experimental forms of liver injury (alcohol-related, drug-induced).154-157 In obese humans, UPR (typically GRP78 expression) and ER stress markers have been noted in the adipose, liver and pancreatic beta cells.158 To date, however, the evidence for operation of hepatic ER stress in human NAFLD/NASH is limited and inconsistent; some pathways seem to be activated, others are not,159 and there have not been informative correlations between pathways and disease phenotype. Likewise, the evidence for operation of ER stress in animal models is conflicting.155,160-163 In particular, there is little evidence that ER stress is a pro-inflammatory pathway in models that exhibit both the metabolic determinants of NAFLD and steatohepatitis pathology, such as HF-fed foz/foz mice (van Rooyen, unpublished data). The inflammasome is a larger multimeric structure that regulates caspase 1 activation.182,183 The NLRP3 (nucleotide-binding domain, leucine-rich repeat containing) inflammasome (also known as cryopyrin or NALP-3) is expressed by myeloid cells and is up-regulated by pathogen-associated molecular patterns (PAMPs). It requires a caspase recruitment domain, and can recruit pro-caspase 1 in the presence of the adapter protein ASC (apoptosis-associated speck-like CRD-domain containing protein). Once all the components of the NALP3 inflammasome are assembled in the cytosol, caspase 1 is released and can promote the cleavage and therefore maturation of pro-inflammatory cytokines (pro-IL-1β, pro-IL-18, and IL33) to promote and sustain inflammation. NLRP3 inflammasome can be activated by several endogenous and exogenous agonists, as reviewed elsewhere.182,183 Salient to NASH, palmitic acid (but not oleic acid) induces activation of the NLRP3-ASC inflammasome to activate caspase 1 and cause IL-1β and IL-18 production.183 This pathway involves mitochondrial production of ROS (Fig. 4). Other agonists that could be relevant include uric acid crystals, which can precipitate in the extracellular space of dying cells, and extracellular DNA, possibly including mitochondrial DNA. The inflammasome is activated in experimental alcohol-induced liver injury,83 and in mice fed the MCD diet, but not in HF diet-induced simple steatosis.184 Csak et al.184 exposed hepatocyte cultures to palmitic acid, and showed that this sensitised liver cells to release IL-1β following the further addition of lipopolysaccharide. In addition, palmitic acid provoked hepatocytes to release undefined "danger signals," which then activated the inflammasome in liver lymphocytes and macrophages to augment release of IL-1β and TNF-α. Other work has confirmed that, under certain circumstances, hepatocytes can themselves secrete chemokines and cytokines.185 Thus, activation of the inflammasome is one of several models by which hepatocytes could play a central role in inflammatory recruitment in NASH, but as indicated next, there are other potential pathways. 6. Ballooned hepatocytes and inflammatory recruitment; is the p53/senescence pathway involved? Ballooned hepatocytes often contain Mallory's hyaline (also known as Mallory-Denk bodies), which are derived from ubiquitin-modified intermediate (cytokeratin [CK]) filaments; ubiquitin staining can be used to identify ballooned cells more clearly.190-193 This destruction of intermediate filaments might indicate that cytoskeletal disruption leads to ballooning, but ultrastructural studies are limited. There is also evidence that foamy, lipid micro-droplets confer the glazed appearance of ballooned hepatocytes rather than hydropic change.190,192,193 Apoptosis is increased in livers with steatohepatitis,101,104,132,193 while circulating peptides liberated by caspase 3 cleavage of CK18, an hepatocyte-specific CK, serves as a biomarker for NASH versus "not NASH. "194,195 The original term for apoptosis was "shrinkage necrosis"; therefore, the presence of ballooning seems more likely to reflect imminent cell necrosis rather than apoptosis. If so, the disintegration products could be pro-inflammatory, and it is well recognized that necrosis, an unregulated form of cell death, activates macrophages, neutrophils (e.g., by high mobility gel box 1 [HMGB1]) and other pro-inflammatory pathways,87,180,196 including the inflammasome discussed earlier. An alternative possibility is that ballooned hepatocytes are a reflection of cellular senescence in the liver. In epithelial cells, stressors such as oxidative stress and DNA damage can lead to replicative senescence.196 In humans, this is particularly associated with shortened telomere length such that cell division is no longer possible.197 Most interest in senescence as a disease mechanism has been for neurodegenerative disorders and cancer;196,197 it does not appear to have been much studied in NASH. However, cirrhosis is associated with loss of telomere length,198 and p53, the guardian of senescence,196,199 is up-regulated in several types of fatty liver disease.200 Senescence arrests cell division by inducing cell cycle inhibitors (p21, p16INK4A, Rb) and has a characteristic molecular expression profile closely linked to regulation of an inflammatory response in neighbouring tissues.197 The pro-inflammatory molecules involved include cytokines (IL-1, IL-6, IL-8), chemokines (IL-8, MCP-1, GRO α/β/γ) and chemokine receptors (CXCR2), most of which are consistently found to be up-regulated in experimental NASH (Table 1).72,86,132,137,201 Further research is required to establish whether hepatocyte senescence is inherent to inflammatory recruitment in the transition of steatosis to NASH. NF-κB is a transcription factor comprised of five peptides that form homodimeric or heterodimeric complexes; p65 and p50 are highly expressed in liver. NF-κB p65:p50 heterodimers regulate the transcription of several hundred pro-inflammatory molecules (p50:p50 tends to be inhibitory), including cytokines, chemokines, adhesion molecules, nitric oxide and cyclooxygenase 2.141 In resting (G0) hepatocytes, NF-κB is sequestered in the cytosol bound to inhibitory (IκB) proteins. Their phosphorylation, mediated by IKK, and subsequent ubiquitination targets the NF-κB -IκB complex to the 26S proteasome for degradation. This liberates NF-κB in a form that can be transported into the nucleus. Detection of p65 in nuclear extracts, or binding to cognate oligonucleotides in gel shift assays serve as indicators of NF-κB activation, together with increased levels of transcripts for "NF-κB-responsive genes." IKK is activated directly by oxidative stress and other cellular stressors (such as ER stress), or via liganding of NF-κB-signaling receptors. NF-κB activation is uniformly found in human NASH202 and in all animal models in which it has been studied. Using MCD fed mice, we employed TNF-α and TNF-R1 knockout animals, and in vivo transfection of WT mice with non-degradable mutant-IκB to show that NF-κB activation is essential for hepatic inflammatory recruitment in steatohepatitis;137 further, such NF-κB activation occurs independently of TNF-α. Other work using the MCD dietary model has produced conflicting findings; curcumin, which blocks oxidative stress-mediated NF-κB activation provided protection,203 but TNF-α anti-serum reduced liver injury in rats administered the MCD diet,204 while Tomita et al.205 found that TNF-R knockout mice had protection against liver fibrosis in their MCD experiments. Fractionation of livers from HF-fed foz/foz mice (Larter, unpublished data) and MCD-fed animals137 shows that NF-κB activation is most prominent in non-parenchymal cells (KCs, SECs, HSCs), but it is also evident in hepatocytes.137,206 The emerging concepts of metabolic stress mentioned earlier provide some indication that pro-inflammatory pathways in NASH could eminate from stressed hepatocytes via activation of NF-κB. Alternatively, TNF-α, IL-1β and other cytokines released from NF-κB-activated KCs could activate NF-κB in neighbouring hepatocytes. Myeloid differentiation primary response gene 88 (Myd88) null mice are refractory to dietary steatohepatitis caused by a choline deficient and defined amino acid (CDAA) diet.207 Using bone marrow chimeric (WT/Myd88-/-) mice, Miura and colleagues showed that the KC compartment was essential for inflammatory recruitment in this model.207 Further, the upstream stimulus to Myd88/NF-κB activation appeared to be Toll-like receptor 9 (TLR9),207 located in endosomes/lysosomes and most responsive to unmethylated CpG-containing DNA. The implication of TLRs and their role in the innate immune response and activation of NF-κB in NASH is discussed later. Like NF-κB, the JNKs (1 and 2) can be activated directly by oxidative stress and by lipotoxic molecules (FFA, FC), or as the result of ligand binding to growth factor and TNF superfamily death-signalling receptors (Fas, TNF-R1, TNF-related apoptosis-inducing ligand death receptors) or TLRs.208 JNK activates the mitochondrial apoptosis pathway and forms the c-jun:c-fos heterodimer, AP-1; AP-1 is pro-inflammatory, typically inducing similar genes as NF-κB. In the foz/foz diabetes/metabolic syndrome model, we have noted that both JNK1 and JNK2 are activated with NASH, but not in genotype or dietary controls with simple steatosis.212 Further, dietary or pharmacological measures that lowered hepatic FC virtually abrogated JNK activation in association with mitigation of liver injury (ALT elevation), hepatocyte apoptosis and macrophage accumulation.123 These observations are consistent with the proposal that JNK activation is a key injury and inflammatory pathway in metabolic syndrome-related NASH. There is little doubt that innate immunity is involved in the inflammatory response in NASH, and this topic has been reviewed elsewhere.70,82,83,85,208 Only the most salient aspects will be mentioned here. 1. Why could innate immunity be relevant to inflammation in NASH? Eight TLRs are expressed in mammalian liver (TLRs 1, 2, 4, 6-10), with varying levels of expression on KCs, hepatocytes, SECs and HSCs.85 Most are expressed on the cell surface, but TLRs 1, 3 and 9 are intracellular (endosomal/lysosomal) proteins. TLRs recognise molecular patterns present on a broad range of pathogens and altered or specialised host molecules. Upon ligand binding and with recruitment of certain co-factors (e.g., myeloid differentiation factor 2 [MD2]), they signal via overlapping protein casettes to trigger inflammatory and antiviral responses, as well as maturation of dendritic cells to activate adaptive immunity.216 Individual TLRs interact with different combinations of adapter proteins (e.g., MD2) and activate transcription factors such as NF-κB, AP-1 (via JNK) and interferon-responsive factors (IRF). As shown in Fig. 5, MyD88 is shared by almost all TLRs and recruits members of the IL-1 receptor-associated kinase family. In fact, the intracellular domain of plasma membrane expressed TLRs exhibits IL-1 receptor motifs, and their intracellular signalling shares several intracellular adapter molecules with IL-1 (Fig. 5). Several types of lymphocytes are present in the normal liver, including NK cells, NK T cells, and T cells.86 Hepatic NK cells can be regulated by KC-derived cytokines (IL-1, IL-18), and in turn generate IFN-γ which participates directly in cell killing and in modulation of T cell responses. Lymphocytes accumulate in NASH livers, but which subpopulations predominate and their pathogenic roles in injury and inflammation have not yet been fully characterized. The presence of neutrophils (polymorphonuclear neutrophils, [PMNs]) among the liver inflammatory infiltrate of alcoholic steatohepatitis has long been recognized. Neutrophils are also present in NASH,29,31 where their possible pathogenic significance remains obscure. In the foz/foz metabolic syndrome model of NASH, the reduction of hepatic cholesterol stores which ameliorates liver injury, apoptosis and macrophage recruitment does not appear to alter accumulation of myeloperoxidase positive cells (PMNs) (van Rooyen, unpublished data). On the other hand, reduction of hepatic triglyceride stores and lipogenesis either by a dietary reversion strategy or with Wy-14,643 (a potent PPAR-α) agonist, has more impressive effects on neutrophils than on macrophages.212 Dietary reversion (from HF to chow) suppressed UCP2 expression and increased hepatic ATP levels, which would favour operation of apoptosis (and this was observed) rather than ROS-mediated necrosis (Larter and Farrell, unpublished data). Combined use of M30 and full-length CK8/18 in patients with NASH indicates that both apoptosis and necrosis occur in humans with the inflammatory form of NAFLD.195 It is therefore possible that neutrophil accumulation is associated with necrosis in NASH, and it may be regulated by different pathways than those important for macrophage and lymphocyte recruitment and activation.87 These important and rather neglected issues require further study. The two hits concept of NASH pathogenesis served to dissect injury and pro-inflammatory pathways from the metabolic causes of steatosis. Insights gained since then indicate that the lipid molecules that accumulate, together with TG, in some NAFLD livers can themselves participate directly in pathogenesis of the necroinflammatory element of NASH. The fact that steatosis (which biochemically is TG accumulation) does not inevitably predispose to NASH is better understood by recent studies showing that TG formation is protective against injury and inflammation, not predisposing to such inflammation.235,236 On the other hand, FC, certain FFA, DAG and some phospholipids can directly injury liver cells and mediate subcellular stresses (mitochondrial, ER, oxidative) that incite hepatocellular injury, cell death and inflammatory recruitment in NASH. Thus, the essential difference between the two extremes of liver pathology (NASH versus not-NASH) is not attributable to the amount of fat (TG) in the liver, but rather the type of lipid molecules that accumulate. Establishing whether the pro-inflammatory pathways in NASH eminate from hepatocytes subjected mitochondrial injury, impaired autophagy, the inflammasome, or from processes like ER stress, oxidative stress/necrosis, senescence and p53 expression is pertinent to the design of novel, mechanism-based therapies for NASH. Current approaches, vitamin E, PPAR-γ ("glitazone") agonists, ursodeoxycholic acid, lipase inhibitors, generally effect some reduction in steatosis severity, but effects on inflammation are less consistent (ezetimibe may be an exception), and there are few reliable reports of fibrosis reduction. Despite interest in the gut-liver axis in obesity, type 2 diabetes and NAFLD, there are few data on clinical improvement with use of probiotics, other measures to alter the intestinal microbiota or use of incretin mimetics. Only bariatric surgery, or other effective means of weight loss coupled to increased physical activity that improve insulin sensitivity seem to combat both steatosis and inflammation in NASH. We therefore need to learn whether this is because of a primary effect on improving insulin sensitivity and reducing hyperinsulinemia, with possible secondary changes to turnover and storage of hepatotoxic lipid species,237 such as we recently clarified for disordered hepatic cholesterol homeostasis.115 If so, the findings could direct a radically different therapeutic approach, perhaps even finding a cure for NASH without what seems presently to be essential- a change in lifestyle and a decrease in body weight. Fig. 1. Excess lipid accumulation activates inflammatory pathways and induces insulin resistance. Extracellular free fatty acids (FFA) activate toll-like receptors (TLR), causing downstream activation of c-Jun N-terminal kinase (JNK) and IκB kinase (IKK) complex (composed of IKKα, IKKβ and NF-κB essential modulator [NEMO]). IKK heterotrimeric holocomplex catalyzes downstream activation of nuclear factor-kappa B (NF-κB), allowing p65 (also known as RELA), a proinflammatory transcription factor, to enter the nucleus where it induces transcriptional expression of multiple proinflammatory chemokines (e.g., macrophage chemotactic protein 1 [MCP-1]), cytokines, and adhesion molecules (e.g., vascular cell adhesion molecule-1). Once activated, JNK activates c-Jun which is involved with hepatocellular cell death, and via formation of heterodimeric c-Jun:c-Fos forms the pro-inflammatory transcription factor, activator protein 1 (AP-1). In addition to TLR activation, some intracellular lipid molecules (Table 2) may result in JNK/NF-κB activation by formation of reactive oxygen species (ROS); ROS may arise from excessive β-oxidation of FFA, uncoupling of oxidative phosphorylation and mitochondrial damage caused by free cholesterol (FC) accumulation and crystallization. Alternatively, some intracellular lipids may induce endoplasmic reticulum (ER) stress, leading to JNK/NF-κB p65 activation (see Fig. 3 for more details). JNK activation can also phosphorylate insulin receptor substrates (IRS)-1 and -2, which by blocking insulin receptor signal transduction leads to insulin resistance. TNF-α, tumor necrosis factor-α; IL-1β, interleukin-1β. Fig. 2. Inflammatory cell recruitment and localization around lipid-laden hepatocytes in HF-fed foz/foz mice with non-alcoholic steatohepatitis (NASH). (A) H&E-stained liver section from HF-fed (0.2% cholesterol) foz/foz mouse with NASH, showing several enlarged hepatocytes with macrosteatotic vacuoles, and at least one ballooned hepatocyte (bottom right). (B) Macrophages (F4/80 positive), and (C) neutrophils (myeloperoxidase positive) accumulate around hepatocytes showing macrosteatotic vacuoles. These livers contain large amounts of free cholesterol.115 Scale bars represent 20 ?m. Fig. 3. Mammalian unfolded protein response (UPR) pathways. The UPR is triggered by several events, including protein unfolding/misfolding, hypoxia, low adenosine triphosphate levels, ER calcium depletion, and protein/sterol over-expression, causing dissociation of 78 kDa glucose-regulated protein (GRP78) from the three UPR sensors, (A) inositol-requiring enzyme 1α (IRE1α), (B) protein kinase RNA-like endoplasmic reticulum kinase (PERK), and (C) activating transcription factor-6 (ATF6). Activated IRE1α undergoes dimerization and autophosphorylation to generate endogenous RNase activity; in turn, this is responsible for splice truncation of X-box binding protein 1 (XBP1S) mRNA. Additionally, IRE1α may also activate the extrinsic apoptosis pathway, in which tumor necrosis factor (TNF) receptor-associated factor 2 (TRAF2)-dependent downstream activation of c-Jun N-terminal kinase (JNK) and caspase-12 takes place. Once activated, PERK undergoes homodimerisation and autophosphorylation to activate eukaryotic translation initiation factor 2 (eIF2α). In turn, this induces ATF4 expression. Separately, dissociation of GRP78, allows ATF6 processing by the Golgi complex, where proteases S1P and S2P cleave an active 50 kDa (p50) ATF6 domain that is free to translocate to the nucleus. Xbp1s, ATF4 and ATF6, as well as other unlisted factors, are responsible for three dominant cell responses to UPR. The folding pathway induces increased expression of molecular chaperones, including GRP78, assisting in compensatory ER protein folding. Alternatively, the cell may respond by increasing ER-associated protein degradation (ERAD) pathway, whereby gene products target and degrade unfolded proteins in the ER. Prolonged UPR results in the activation of the intrinsic apoptosis pathway; this ATF6 and ATF4-dependent process induces C/EBP-homologous protein (CHOP) expression. In turn, CHOP inhibits B-cell lymphoma 2 and induces apoptosis. Fig. 4. Mitophagy inhibits pathways of mitochondrial dysfunction and associated cell death and inflammation. Mitophagy restitutes physiological cell functioning by inhibiting mitochondrial-related cell death and/or injury arising either from the generation of reactive oxygen-species (ROS) or pro-inflammatory signals, or as a result of mitochondrial membrane permeability transition (MPT). During activation of the intrinsic apoptosis pathway, BH3-only protein members, including BAK and BAX, effect mitochondrial membrane permeabilisation (MOMP) and release of intermembrane space proteins, including cytochrome c which induces a downstream caspase cascade activation that leads to apoptosis. Alternatively, necrotic cell death may be initiated by cyclophilin D-dependent initiation of MPT pore. Once opened, MPT destroys the mitochondrial transmembrane potential (Δψm), thereby abrogating oxidative phosphorylation and exacerbating ROS generation. Excessive ROS formation can activate the NACHT, LRR and PYD domains-containing protein 3 (NALP3) inflammasome. Uncoupling of oxidative phosphorylation can also trigger MPT, during which mtDNA may undergo cytoplasmic translocation, leading to nuclear factor-kappa B (NF-κB) and interferon regulatory factor-dependent inflammatory pathway activation. Importantly, excess intra-mitochondrial ROS is able to mutate mitochondrial DNA (mtDNA), leading to premature aging and mitochondrial inefficiency post-replication (this in turn exacerbates ROS generation through impaired oxidative phosphorylation). Fig. 5. Toll-like receptor (TLR) signalling involves JNK and NF-κB p65 activation. Toll-like receptors (TLR) constitute a family of receptors involved in pro-inflammatory signalling in the innate immune system, responsible for the recognition of pathogen-associated molecular patterns (PAMPs) and exogenous stimuli, such as pathogens, or endogenous agonists, such as sterile tissue damage; the later are termed danger-associated molecular patterns (DAMPs). Of the 9 known TLR receptors, four (TLR-3, -7, -8, and -9) are expressed on the endosomal membrane and are responsible for viral particle surveillance, including detection of deoxy-cytidylate-phosphate-deoxy-guanylate DNA (CpG-DNA), and single- and double-stranded RNA. The remaining TLRs are expressed on the plasma membrane and are responsible for the detection of extracellular microbial pathogens. Relevant PAMPs include: LPS, diacyl- and triacyl lipopeptides, and flagellin, as well as several DAMPs, including HMGB1. Activated TLR3, as well as TLR4, signal through adaptor protein TIR-domain-containing adapter-inducing interferon-β (TRIF), which in turn recruits RIP1 to activate the IKK complex, thereby activating nuclear factor-kappa B (NF-κB). The other TLRs signal through toll/interleukin-1 receptor domain containing adaptor protein (TIRAP) and myeloid differentiation factor 88 (Myd88). Activated Myd88 induces the recruitment of IL-1R-associated kinase (IRAK) 4, as well as IRAK1, which bind TRAF-6 and transforming growth factor-β activated kinase (TAK)-1. IRF5 and IRF7 are then recruited to the post-Myd88 protein complex. Interferon-regulatory factor 7 (IRF7) recruitment is dependent upon on TLR7 and TLR9 signalling. The IRAK1/4/TRAF6/TAK1/IRF5/7 complex is responsible for downstream Myd88-dependent activation of c-Jun N-terminal kinase (JNK) and NF-κB. TRAF, tumor necrosis factor (TNF) receptor-associated factor; MEKK, MAP kinase kinase kinase; MKK, mitogen-activated protein kinase kinase; ASK, apoptosis signal-regulating kinase. IKK, IκB kinase; ROS, reactive oxygen species; Myd88, myeloid differentiation primary response gene 88; ER, endoplasmic reticulum; TLRs, toll-like receptors; NF-κB, nuclear factor-kappa B; JNK, c-Jun N-terminal kinase; FC, free cholesterol; AP-1, activator protein 1; MCD, methionine and choline deficiency; MCP-1, macrophage chemotactic protein 1; CCR-2, chemokine (C-C motif) receptor 2; MIP-1, macrophage inflammatory protein 1; PMN, polymorphonuclear neutrophils; TNF-α, tumor necrosis factor-α; NAFLD, non-alcoholic fatty liver disease; IFN-γ, interferon-gamma; IRFs, interferon-regulatory factors; CYPs2E1, cytochromes P450 2E1; KCs, Kupffer cells; HMGB1, high mobility gel box 1; COX-2, cyclooxygenase 2; ICAM, intercellular adhesion molecule; VCAM, vascular cell adhesion molecule. *for further details and references, see text. NASH, non-alcoholic steatohepatitis; TG, triglyceride; DAG, di-acylglycerides; FFA, free fatty acids; JNK, c-Jun N-terminal kinase; HCC, hepatocellular carcinoma; ROS, reactive oxygen species; TG, triacylglycerides; FC, free cholesterol; GSH, glutathione; TNF-α, tumor necrosis factor-α; CE, cholesterol ester; FA, fatty acyl. *for further comments and references, please refer to the text. Amarapurkar DN, Hashimoto E, Lesmana LA, et al. How common is non-alcoholic fatty liver disease in the Asia-Pacific region and are there local differences?. J Gastroenterol Hepatol. 2007;22;788-793. Farrell GC, Larter CZ. Nonalcoholic fatty liver disease: from steatosis to cirrhosis. Hepatology. 2006;43;S99-S112. Larter CZ, Chitturi S, Heydet D, Farrell GC. A fresh look at NASH pathogenesis. Part 1: the metabolic movers. J Gastroenterol Hepatol. 2010;25;672-690. Chitturi S, Wong VW, Farrell G. Nonalcoholic fatty liver in Asia: firmly entrenched and rapidly gaining ground. J Gastroenterol Hepatol. 2011;26;163-172. Wong VW, Chu WC, Wong GL, et al. Prevalence of nonalcoholic fatty liver disease and advanced fibrosis in Hong Kong Chinese: a population study using proton-magnetic resonance spectroscopy and transient elastography. Gut. 2012;61;409-415. Williams CD, Stengel J, Asike MI, et al. Prevalence of nonalcoholic fatty liver disease and nonalcoholic steatohepatitis among a largely middle-aged population utilizing ultrasound and liver biopsy: a prospective study. Gastroenterology. 2011;140;124-131. Chitturi S, Farrell GC, Hashimoto E, et al. Non-alcoholic fatty liver disease in the Asia-Pacific region: definitions and overview of proposed guidelines. J Gastroenterol Hepatol. 2007;22;778-787. Fan JG, Saibara T, Chitturi S, et al. What are the risk factors and settings for non-alcoholic fatty liver disease in Asia-Pacific?. J Gastroenterol Hepatol. 2007;22;794-800. Neuschwander-Tetri BA, Clark JM, Bass NM, et al. Clinical, laboratory and histological associations in adults with nonalcoholic fatty liver disease. Hepatology. 2010;52;913-924. Musso G, Gambino R, Cassader M. Non-alcoholic fatty liver disease from pathogenesis to management: an update. Obes Rev. 2010;11;430-445. Neuschwander-Tetri BA. Nonalcoholic steatohepatitis and the metabolic syndrome. Am J Med Sci. 2005;330;326-335. Ekstedt M, Franz?n LE, Mathiesen UL, et al. Long-term follow-up of patients with NAFLD and elevated liver enzymes. Hepatology. 2006;44;865-873. Yun KE, Shin CY, Yoon YS, Park HS. Elevated alanine aminotransferase levels predict mortality from cardiovascular disease and diabetes in Koreans. Atherosclerosis. 2009;205;533-537. Fan JG, Farrell GC. Does non-alcoholic fatty liver disease predispose patients to type 2 diabetes in the absence of obesity?. J Gastroenterol Hepatol. 2010;25;223-225. Chitturi S, Farrell GC. Clues from the carotids: an appraisal of cardiovascular disease risk in non-alcoholic fatty liver disease. J Gastroenterol Hepatol. 2009;24;1315-1317. Targher G, Day CP. Liver enzymes, nonalcoholic fatty liver disease, and incident cardiovascular disease. Hepatology. 2011;53;375. Okanoue T, Umemura A, Yasui K, Itoh Y. Nonalcoholic fatty liver disease and nonalcoholic steatohepatitis in Japan. J Gastroenterol Hepatol. 2011;26;153-162. Speliotes EK, Yerges-Armstrong LM, Wu J, et al. Genome-wide association analysis identifies variants associated with nonalcoholic fatty liver disease that have distinct effects on metabolic traits. PLoS Genet. 2011;7;e1001324. Schwimmer JB, Celedon MA, Lavine JE, et al. Heritability of nonalcoholic fatty liver disease. Gastroenterology. 2009;136;1585-1592. Newton JL, Jones DE, Henderson E, et al. Fatigue in nonalcoholic fatty liver disease (NAFLD) is significant and associates with inactivity and excessive daytime sleepiness but not with liver disease severity or insulin resistance. Gut. 2008;57;807-813. Thoma C, Day CP, Trenell MI. Lifestyle interventions for the treatment of non-alcoholic fatty liver disease in adults: a systematic review. J Hepatol. 2012;56;255-266. Romeo S, Kozlitina J, Xing C, et al. Genetic variation in PNPLA3 confers susceptibility to nonalcoholic fatty liver disease. Nat Genet. 2008;40;1461-1465. Kotronen A, Johansson LE, Johansson LM, et al. A common variant in PNPLA3, which encodes adiponutrin, is associated with liver fat content in humans. Diabetologia. 2009;52;1056-1060. Kantartzis K, Peter A, Machicao F, et al. Dissociation between fatty liver and insulin resistance in humans carrying a variant of the patatin-like phospholipase 3 gene. Diabetes. 2009;58;2616-2623. Speliotes EK, Butler JL, Palmer CD, et al. PNPLA3 variants specifically confer increased risk for histologic nonalcoholic fatty liver disease but not metabolic disease. Hepatology. 2010;52;904-912. Yuan X, Waterworth D, Perry JR, et al. Population-based genome-wide association studies reveal six loci influencing plasma levels of liver enzymes. Am J Hum Genet. 2008;83;520-528. Sookoian S, Pirola CJ. Meta-analysis of the influence of I148M variant of patatin-like phospholipase domain containing 3 gene (PNPLA3) on the susceptibility and histological severity of nonalcoholic fatty liver disease. Hepatology. 2011;53;1883-1894. Tian C, Stokowski RP, Kershenobich D, Ballinger DG, Hinds DA. Variant in PNPLA3 is associated with alcoholic liver disease. Nat Genet. 2010;42;21-23. Brunt EM, Janney CG, Di Bisceglie AM, Neuschwander-Tetri BA, Bacon BR. Nonalcoholic steatohepatitis: a proposal for grading and staging the histological lesions. Am J Gastroenterol. 1999;94;2467-2474. Kleiner DE, Brunt EM, Van Natta M, et al. Design and validation of a histological scoring system for nonalcoholic fatty liver disease. Hepatology. 2005;41;1313-1321. Yeh MM, Brunt EM. Pathology of nonalcoholic fatty liver disease. Am J Clin Pathol. 2007;128;837-847. Bugianesi E, Leone N, Vanni E, et al. Expanding the natural history of nonalcoholic steatohepatitis: from cryptogenic cirrhosis to hepatocellular carcinoma. Gastroenterology. 2002;123;134-140. Matteoni CA, Younossi ZM, Gramlich T, Boparai N, Liu YC, Mc-Cullough AJ. Nonalcoholic fatty liver disease: a spectrum of clinical and pathological severity. Gastroenterology. 1999;116;1413-1419. Dam-Larsen S, Franzmann M, Andersen IB, et al. Long term prognosis of fatty liver: risk of chronic liver disease and death. Gut. 2004;53;750-755. Hui JM, Kench JG, Chitturi S, et al. Long-term outcomes of cirrhosis in nonalcoholic steatohepatitis compared with hepatitis C. Hepatology. 2003;38;420-427. Adams LA, Lymp JF, St Sauver J, et al. The natural history of nonalcoholic fatty liver disease: a population-based cohort study. Gastroenterology. 2005;129;113-121. Bhala N, Angulo P, van der Poorten D, et al. The natural history of nonalcoholic fatty liver disease with advanced fibrosis or cirrhosis: an international collaborative study. Hepatology. 2011;54;1208-1216. Teli MR, James OF, Burt AD, Bennett MK, Day CP. The natural history of nonalcoholic fatty liver: a follow-up study. Hepatology. 1995;22;1714-1719. Guha IN, Parkes J, Roderick P, et al. Noninvasive markers of fibrosis in nonalcoholic fatty liver disease: validating the European Liver Fibrosis Panel and exploring simple markers. Hepatology. 2008;47;455-460. Wong VW, Chan HL. Transient elastography. J Gastroenterol Hepatol. 2010;25;1726-1731. Wong VW, Vergniol J, Wong GL, et al. Diagnosis of fibrosis and cirrhosis using liver stiffness measurement in nonalcoholic fatty liver disease. Hepatology. 2010;51;454-462. Adams LA. Biomarkers of liver fibrosis. J Gastroenterol Hepatol. 2011;26;802-809. Adams LA, George J, Bugianesi E, et al. Complex non-invasive fibrosis models are more accurate than simple models in non-alcoholic fatty liver disease. J Gastroenterol Hepatol. 2011;26;1536-1543. Musso G, Gambino R, Cassader M, Pagano G. Meta-analysis: natural history of non-alcoholic fatty liver disease (NAFLD) and diagnostic accuracy of non-invasive tests for liver disease severity. Ann Med. 2011;43;617-649. Brunt EM, Kleiner DE, Wilson LA, Belt P, Neuschwander-Tetri BA. Nonalcoholic fatty liver disease (NAFLD) activity score and the histopathologic diagnosis in NAFLD: distinct clinicopathologic meanings. Hepatology. 2011;53;810-820. Hashimoto E, Tokushige K, Farrell GC. Histological features of non-alcoholic fatty liver disease: what is important?. J Gastroenterol Hepatol. 2012;27;5-7. Younossi ZM, Stepanova M, Rafiq N, et al. Pathologic criteria for nonalcoholic steatohepatitis: interprotocol agreement and ability to predict liver-related mortality. Hepatology. 2011;53;1874-1882. Chalasani N, Wilson L, Kleiner DE, et al. Relationship of steatosis grade and zonal location to histological features of steatohepatitis in adult patients with non-alcoholic fatty liver disease. J Hepatol. 2008;48;829-834. Angulo P. Diagnosing steatohepatitis and predicting liver-related mortality in patients with NAFLD: two distinct concepts. Hepatology. 2011;53;1792-1794. Brunt EM, Kleiner DE, Wilson LA, et al. Portal chronic inflammation in nonalcoholic fatty liver disease (NAFLD): a histologic marker of advanced NAFLD-Clinicopathologic correlations from the nonalcoholic steatohepatitis clinical research network. Hepatology. 2009;49;809-820. Argo CK, Northup PG, Al-Osaimi AM, Caldwell SH. Systematic review of risk factors for fibrosis progression in non-alcoholic steatohepatitis. J Hepatol. 2009;51;371-379. Chitturi S, Abeygunasekera S, Farrell GC, et al. NASH and insulin resistance: insulin hypersecretion and specific association with the insulin resistance syndrome. Hepatology. 2002;35;373-379. Marchesini G, Bugianesi E, Forlani G, et al. Nonalcoholic fatty liver, steatohepatitis, and the metabolic syndrome. Hepatology. 2003;37;917-923. Alkhouri N, Tamimi TA, Yerian L, Lopez R, Zein NN, Feldstein AE. The inflamed liver and atherosclerosis: a link between histologic severity of nonalcoholic fatty liver disease and increased cardiovascular risk. Dig Dis Sci. 2010;55;2644-2650. Park SH, Kim BI, Kim SH, et al. Body fat distribution and insulin resistance: beyond obesity in nonalcoholic fatty liver disease among overweight men. J Am Coll Nutr. 2007;26;321-326. Park BJ, Kim YJ, Kim DH, et al. Visceral adipose tissue area is an independent risk factor for hepatic steatosis. J Gastroenterol Hepatol. 2008;23;900-907. Harris RB, Leibel RL. Location, location, location. Cell Metab. 2008;7;359-361. Fain JN, Madan AK, Hiler ML, Cheema P, Bahouth SW. Comparison of the release of adipokines by adipose tissue, adipose tissue matrix, and adipocytes from visceral and subcutaneous abdominal adipose tissues of obese humans. Endocrinology. 2004;145;2273-2282. Perrini S, Laviola L, Cignarelli A, et al. Fat depot-related differences in gene expression, adiponectin secretion, and insulin action and signalling in human adipocytes differentiated in vitro from precursor stromal cells. Diabetologia. 2008;51;155-164. Stanton MC, Chen SC, Jackson JV, et al. Inflammatory Signals shift from adipose to liver during high fat feeding and influence the development of steatohepatitis in mice. J Inflamm (Lond). 2011;8;8. Lanthier N, Molendi-Coste O, Cani PD, van Rooijen N, Horsmans Y, Leclercq IA. Kupffer cell depletion prevents but has no therapeutic effect on metabolic and inflammatory changes induced by a high-fat diet. FASEB J. 2011;25;4301-4311. Takahashi K, Mizuarai S, Araki H, et al. Adiposity elevates plasma MCP-1 levels leading to the increased CD11b-positive monocytes in mice. J Biol Chem. 2003;278;46654-46660. Kanda H, Tateya S, Tamori Y, et al. MCP-1 contributes to macrophage infiltration into adipose tissue, insulin resistance, and hepatic steatosis in obesity. J Clin Invest. 2006;116;1494-1505. Schenk S, Saberi M, Olefsky JM. Insulin sensitivity: modulation by nutrients and inflammation. J Clin Invest. 2008;118;2992-3002. Saberi M, Woods NB, de Luca C, et al. Hematopoietic cell-specific deletion of toll-like receptor 4 ameliorates hepatic and adipose tissue insulin resistance in high-fat-fed mice. Cell Metab. 2009;10;419-429. Weisberg SP, Hunter D, Huber R, et al. CCR2 modulates inflammatory and metabolic effects of high-fat feeding. J Clin Invest. 2006;116;115-124. Haukeland JW, Dam?s JK, Konopski Z, et al. Systemic inflammation in nonalcoholic fatty liver disease is characterized by elevated levels of CCL2. J Hepatol. 2006;44;1167-1174. Arkan MC, Hevener AL, Greten FR, et al. IKK-beta links inflammation to obesity-induced insulin resistance. Nat Med. 2005;11;191-198. Cai D, Yuan M, Frantz DF, et al. Local and systemic insulin resistance resulting from hepatic activation of IKK-beta and NF-kappaB. Nat Med. 2005;11;183-190. Maher JJ, Leon P, Ryan JC. Beyond insulin resistance: innate immunity in nonalcoholic steatohepatitis. Hepatology. 2008;48;670-678. Cl?ment S, Juge-Aubry C, Sgroi A, et al. Monocyte chemoattractant protein-1 secreted by adipose tissue induces direct lipid accumulation in hepatocytes. Hepatology. 2008;48;799-807. Larter CZ, Farrell GC. Insulin resistance, adiponectin, cytokines in NASH: which is the best target to treat?. J Hepatol. 2006;44;253-261. Masaki T, Chiba S, Tatsukawa H, et al. Adiponectin protects LPS-induced liver injury through modulation of TNF-alpha in KK-Ay obese mice. Hepatology. 2004;40;177-184. Hui JM, Hodge A, Farrell GC, Kench JG, Kriketos A, George J. Beyond insulin resistance in NASH: TNF-alpha or adiponectin?. Hepatology. 2004;40;46-54. Marra F, Bertolani C. Adipokines in liver diseases. Hepatology. 2009;50;957-969. Krysiak R, Zmuda W, Okopien B. The effect of ezetimibe, administered alone or in combination with simvastatin, on lymphocyte cytokine release in patients with elevated cholesterol levels. J Intern Med. 2012;271;32-42. Cani PD, Possemiers S, Van de Wiele T, et al. Changes in gut microbiota control inflammation in obese mice through a mechanism involving GLP-2-driven improvement of gut permeability. Gut. 2009;58;1091-1103. Wigg AJ, Roberts-Thomson IC, Dymock RB, McCarthy PJ, Grose RH, Cummins AG. The role of small intestinal bacterial overgrowth, intestinal permeability, endotoxaemia, and tumour necrosis factor alpha in the pathogenesis of non-alcoholic steatohepatitis. Gut. 2001;48;206-211. Miele L, Valenza V, La Torre G, et al. Increased intestinal permeability and tight junction alterations in nonalcoholic fatty liver disease. Hepatology. 2009;49;1877-1887. Brun P, Castagliuolo I, Di Leo V, et al. Increased intestinal permeability in obese mice: new evidence in the pathogenesis of nonalcoholic steatohepatitis. Am J Physiol Gastrointest Liver Physiol. 2007;292;G518-G525. Li Z, Soloski MJ, Diehl AM. Dietary factors alter hepatic innate immune system in mice with nonalcoholic fatty liver disease. Hepatology. 2005;42;880-885. Szabo G, Mandrekar P, Dolganiuc A. Innate immune response and hepatic inflammation. Semin Liver Dis. 2007;27;339-350. Mandrekar P, Szabo G. Signalling pathways in alcohol-induced liver inflammation. J Hepatol. 2009;50;1258-1266. Schwabe RF, Seki E, Brenner DA. Toll-like receptor signaling in the liver. Gastroenterology. 2006;130;1886-1900. Tacke F, Luedde T, Trautwein C. Inflammatory pathways in liver homeostasis and liver injury. Clin Rev Allergy Immunol. 2009;36;4-12. Jaeschke H. Reactive oxygen and mechanisms of inflammatory liver injury: present concepts. J Gastroenterol Hepatol. 2011;26;173-179. Puri P, Baillie RA, Wiest MM, et al. A lipidomic analysis of nonalcoholic fatty liver disease. Hepatology. 2007;46;1081-1090. Neuschwander-Tetri BA. Nontriglyceride hepatic lipotoxicity: the new paradigm for the pathogenesis of NASH. Curr Gastroenterol Rep. 2010;12;49-56. Neuschwander-Tetri BA. Hepatic lipotoxicity and the pathogenesis of nonalcoholic steatohepatitis: the central role of nontriglyceride fatty acid metabolites. Hepatology. 2010;52;774-788. Bass NM. Lipidomic dissection of nonalcoholic steatohepatitis: moving beyond foie gras to fat traffic. Hepatology. 2010;51;4-7. Alkhouri N, Dixon LJ, Feldstein AE. Lipotoxicity in nonalcoholic fatty liver disease: not all lipids are created equal. Expert Rev Gastroenterol Hepatol. 2009;3;445-451. Ginsberg HN. Is the slippery slope from steatosis to steatohepatitis paved with triglyceride or cholesterol. Cell Metab. 2006;4;179-181. Caballero F, Fern?ndez A, De Lacy AM, Fern?ndez-Checa JC, Caballer?a J, Garc?a-Ruiz C. Enhanced free cholesterol, SREBP-2 and StAR expression in human NASH. J Hepatol. 2009;50;789-796. Han MS, Park SY, Shinzawa K, et al. Lysophosphatidylcholine as a death effector in the lipoapoptosis of hepatocytes. J Lipid Res. 2008;49;84-97. Puri P, Wiest MM, Cheung O, et al. The plasma lipidomic signature of nonalcoholic steatohepatitis. Hepatology. 2009;50;1827-1838. Lee GS, Yan JS, Ng RK, Kakar S, Maher JJ. Polyunsaturated fat in the methionine-choline-deficient diet influences hepatic inflammation but not hepatocellular injury. J Lipid Res. 2007;48;1885-1896. Larter CZ, Yeh MM, Cheng J, et al. Activation of peroxisome proliferator-activated receptor alpha by dietary fish oil attenuates steatosis, but does not prevent experimental steatohepatitis because of hepatic lipoperoxide accumulation. J Gastroenterol Hepatol. 2008;23;267-275. Pickens MK, Yan JS, Ng RK, et al. Dietary sucrose is essential to the development of liver injury in the methionine-choline-deficient model of steatohepatitis. J Lipid Res. 2009;50;2072-2082. Tetri LH, Basaranoglu M, Brunt EM, Yerian LM, Neuschwander-Tetri BA. Severe NAFLD with hepatic necroinflammatory changes in mice fed trans fats and a high-fructose corn syrup equivalent. Am J Physiol Gastrointest Liver Physiol. 2008;295;G987-G995. Li Z, Berk M, McIntyre TM, Gores GJ, Feldstein AE. The lysosomal-mitochondrial axis in free fatty acid-induced hepatic lipotoxicity. Hepatology. 2008;47;1495-1503. Nolan CJ, Larter CZ. Lipotoxicity: why do saturated fatty acids cause and monounsaturates protect against it?. J Gastroenterol Hepatol. 2009;24;703-706. Bass NM, Merriman RB. Fatty acid metabolism and lipotoxicity in the pathogenesis of NAFLD/NASH. In: Farrell GC, George J, Hall P, de la M, McCullough AJ. Fatty liver disease: NASH and related disorders. Malden: USA: Blackwell Publishing; 2005. p. 109-122. Malhi H, Gores GJ. Molecular mechanisms of lipotoxicity in nonalcoholic fatty liver disease. Semin Liver Dis. 2008;28;360-369. Wei Y, Wang D, Topczewski F, Pagliassotti MJ. Saturated fatty acids induce endoplasmic reticulum stress and apoptosis independently of ceramide in liver cells. Am J Physiol Endocrinol Metab. 2006;291;E275-E281. Kakisaka K, Cazanave SC, Fingas CD. Lysophosphatidylcholine is a likely mediator of free fatty acid-induced hepatocyte lipoapoptosis. Hepatology. 2011;54;399A. Nakamura S, Takamura T, Matsuzawa-Nagata N, et al. Palmitate induces insulin resistance in H4IIEC3 hepatocytes through reactive oxygen species produced by mitochondria. J Biol Chem. 2009;284;14809-14818. Larter CZ, Yeh MM. Animal models of NASH: getting both pathology and metabolic context right. J Gastroenterol Hepatol. 2008;23;1635-1648. Maher JJ. New insights from rodent models of fatty liver disease. Antioxid Redox Signal. 2011;15;535-550. Mar? M, Caballero F, Colell A, et al. Mitochondrial free cholesterol loading sensitizes to TNF- and Fas-mediated steatohepatitis. Cell Metab. 2006;4;185-198. Mar? M, Colell A, Morales A, et al. Mechanism of mitochondrial glutathione-dependent hepatocellular susceptibility to TNF despite NF-kappaB activation. Gastroenterology. 2008;134;1507-1520. Yao PM, Tabas I. Free cholesterol loading of macrophages induces apoptosis involving the fas pathway. J Biol Chem. 2000;275;23807-23813. Li Y, Ge M, Ciani L, et al. Enrichment of endoplasmic reticulum with cholesterol inhibits sarcoplasmic-endoplasmic reticulum calcium ATPase-2b activity in parallel with increased order of membrane lipids: implications for depletion of endoplasmic reticulum calcium stores and apoptosis in cholesterol-loaded macrophages. J Biol Chem. 2004;279;37030-37039. Larter CZ, Yeh MM, Van Rooyen DM, et al. Roles of adipose restriction and metabolic factors in progression of steatosis to steatohepatitis in obese, diabetic mice. J Gastroenterol Hepatol. 2009;24;1658-1668. Van Rooyen DM, Larter CZ, Haigh WG, et al. Hepatic free cholesterol accumulates in obese, diabetic mice and causes nonalcoholic steatohepatitis. Gastroenterology. 2011;141;1393-1403. Ota T, Takamura T, Kurita S, et al. Insulin resistance accelerates a dietary rat model of nonalcoholic steatohepatitis. Gastroenterology. 2007;132;282-293. Xu ZJ, Fan JG, Ding XD, Qiao L, Wang GL. Characterization of high-fat, diet-induced, non-alcoholic steatohepatitis with fibrosis in rats. Dig Dis Sci. 2010;55;931-940. Vijay-Kumar M, Aitken JD, Carvalho FA, Ziegler TR, Gewirtz AT, Ganji V. Loss of function mutation in toll-like receptor-4 does not offer protection against obesity and insulin resistance induced by a diet high in trans fat in mice. J Inflamm (Lond). 2011;8;2. Lo L, McLennan SV, Williams PF, et al. Diabetes is a progression factor for hepatic fibrosis in a high fat fed mouse obesity model of non-alcoholic steatohepatitis. J Hepatol. 2011;55;435-444. Varela-Rey M, Embade N, Ariz U, Lu SC, Mato JM, Mart?nez-Chantar ML. Non-alcoholic steatohepatitis and animal models: understanding the human disease. Int J Biochem Cell Biol. 2009;41;969-976. Anstee QM, Goldin RD. Mouse models in non-alcoholic fatty liver disease and steatohepatitis research. Int J Exp Pathol. 2006;87;1-16.
van Rooyen DM, Larter CZ, Yeh MM, Haigh WG, Teoh N, Farrell GC. Ezetimibe and artorvastatin ameliorate liver injury in foz/foz mice with NASH. J Gastroenterol Hepatol. 2011;26;2. Tabas I. Free cholesterol-induced cytotoxicity a possible contributing factor to macrophage foam cell necrosis in advanced atherosclerotic lesions. Trends Cardiovasc Med. 1997;7;256-263. Wouters K, van Gorp PJ, Bieghs V, et al. Dietary cholesterol, rather than liver steatosis, leads to hepatic inflammation in hyperlipidemic mouse models of nonalcoholic steatohepatitis. Hepatology. 2008;48;474-486. Wouters K, van Bilsen M, van Gorp PJ, et al. Intrahepatic cholesterol influences progression, inhibition and reversal of nonalcoholic steatohepatitis in hyperlipidemic mice. FEBS Lett. 2010;584;1001-1005. Day CP, James OF. Steatohepatitis: a tale of two "hits". Gastroenterology. 1998;114;842-845. Yang SQ, Lin HZ, Lane MD, Clemens M, Diehl AM. Obesity increases sensitivity to endotoxin liver injury: implications for the pathogenesis of steatohepatitis. Proc Natl Acad Sci U S A. 1997;94;2557-2562. Li Z, Yang S, Lin H, et al. Probiotics and antibodies to TNF inhibit inflammatory activity and improve nonalcoholic fatty liver disease. Hepatology. 2003;37;343-350. Chitturi S, Farrell GC. Etiopathogenesis of nonalcoholic steatohepatitis. Semin Liver Dis. 2001;21;27-41. Crespo J, Cay?n A, Fern?ndez-Gil P, et al. Gene expression of tumor necrosis factor alpha and TNF-receptors, p55 and p75, in nonalcoholic steatohepatitis patients. Hepatology. 2001;34;1158-1163. Carter-Kent C, Zein NN, Feldstein AE. Cytokines in the pathogenesis of fatty liver and disease progression to steatohepatitis: implications for treatment. Am J Gastroenterol. 2008;103;1036-1042. Tilg H, Moschen AR. Evolution of inflammation in nonalcoholic fatty liver disease: the multiple parallel hits hypothesis. Hepatology. 2010;52;1836-1846. Syn WK, Yang L, Chiang DJ, et al. Genetic differences in oxidative stress and inflammatory responses to diet-induced obesity do not alter liver fibrosis in mice. Liver Int. 2009;29;1262-1272. Deng QG, She H, Cheng JH, et al. Steatohepatitis induced by intragastric overfeeding in mice. Hepatology. 2005;42;905-914. Memon RA, Grunfeld C, Feingold KR. TNF-alpha is not the cause of fatty liver disease in obese diabetic mice. Nat Med. 2001;7;2-3. Dela Pe?a A, Leclercq I, Field J, George J, Jones B, Farrell G. NF-kappaB activation, rather than TNF, mediates hepatic inflammation in a murine dietary model of steatohepatitis. Gastroenterology. 2005;129;1663-1674. Lu SC, Alvarez L, Huang ZZ, et al. Methionine adenosyltransferase 1A knockout mice are predisposed to liver injury and exhibit increased expression of genes involved in proliferation. Proc Natl Acad Sci U S A. 2001;98;5560-5565. Leclercq IA, Farrell GC, Field J, Bell DR, Gonzalez FJ, Robertson GR. CYP2E1 and CYP4A as microsomal catalysts of lipid peroxides in murine nonalcoholic steatohepatitis. J Clin Invest. 2000;105;1067-1075. George J, Pera N, Phung N, Leclercq I, Yun Hou J, Farrell G. Lipid peroxidation, stellate cell activation and hepatic fibrogenesis in a rat model of chronic steatohepatitis. J Hepatol. 2003;39;756-764. Yu J, Ip E, Dela Pe?a A, et al. COX-2 induction in mice with experimental nutritional steatohepatitis: role as pro-inflammatory mediator. Hepatology. 2006;43;826-836. Ip E, Farrell G, Hall P, Robertson G, Leclercq I. Administration of the potent PPARalpha agonist, Wy-14,643, reverses nutritional fibrosis and steatohepatitis in mice. Hepatology. 2004;39;1286-1296. Seki S, Kitada T, Yamada T, Sakaguchi H, Nakatani K, Wakasa K. In situ detection of lipid peroxidation and oxidative DNA damage in non-alcoholic fatty liver diseases. J Hepatol. 2002;37;56-62. MacDonald GA, Bridle KR, Ward PJ, et al. Lipid peroxidation in hepatic steatosis in humans is associated with hepatic fibrosis and occurs predominately in acinar zone 3. J Gastroenterol Hepatol. 2001;16;599-606. Videla LA, Rodrigo R, Orellana M, et al. Oxidative stress-related parameters in the liver of non-alcoholic fatty liver disease patients. Clin Sci (Lond). 2004;106;261-268. Weltman MD, Farrell GC, Hall P, Ingelman-Sundberg M, Liddle C. Hepatic cytochrome P450 2E1 is increased in patients with nonalcoholic steatohepatitis. Hepatology. 1998;27;128-133. Chalasani N, Gorski JC, Asghar MS, et al. Hepatic cytochrome P450 2E1 activity in nondiabetic patients with nonalcoholic steatohepatitis. Hepatology. 2003;37;544-550. Gornicka A, Morris-Stiff G, Thapaliya S, Papouchado BG, Berk M, Feldstein AE. Transcriptional profile of genes involved in oxidative stress and antioxidant defense in a dietary murine model of steatohepatitis. Antioxid Redox Signal. 2011;15;437-445. Koek GH, Liedorp PR, Bast A. The role of oxidative stress in nonalcoholic steatohepatitis. Clin Chim Acta. 2011;412;1297-1305. Phung N, Pera N, Farrell G, Leclercq I, Hou JY, George J. Pro-oxidant-mediated hepatic fibrosis and effects of antioxidant intervention in murine dietary steatohepatitis. Int J Mol Med. 2009;24;171-180. Yu J, Chu ES, Wang R, et al. Heme oxygenase-1 protects against steatohepatitis in both cultured hepatocytes and mice. Gastroenterology. 2010;138;Array-704. Sanyal AJ, Chalasani N, Kowdley KV, et al. Pioglitazone, vitamin E, or placebo for nonalcoholic steatohepatitis. N Engl J Med. 2010;362;1675-1685. Schr?der M, Kaufman RJ. The mammalian unfolded protein response. Annu Rev Biochem. 2005;74;739-789. Dara L, Ji C, Kaplowitz N. The contribution of endoplasmic reticulum stress to liver diseases. Hepatology. 2011;53;1752-1763. Leclercq IA, Van Rooyen DM, Farrell GC. Hepatic endoplasmic reticulum stress in obesity: deeper insights into processes, but are they relevant to nonalcoholic steatohepatitis?. Hepatology. 2011;54;2260-2265. Kaplowitz N, Ji C. Unfolding new mechanisms of alcoholic liver disease in the endoplasmic reticulum. J Gastroenterol Hepatol. 2006;21;S7-S9. Ji C, Kaplowitz N, Lau MY, Kao E, Petrovic LM, Lee AS. Liver-specific loss of glucose-regulated protein 78 perturbs the unfolded protein response and exacerbates a spectrum of liver diseases in mice. Hepatology. 2011;54;229-239. Gregor MF, Yang L, Fabbrini E, et al. Endoplasmic reticulum stress is reduced in tissues of obese subjects after weight loss. Diabetes. 2009;58;693-700. Puri P, Mirshahi F, Cheung O, et al. Activation and dysregulation of the unfolded protein response in nonalcoholic fatty liver disease. Gastroenterology. 2008;134;568-576. Rahman SM, Schroeder-Gloeckler JM, Janssen RC, et al. CCAAT/enhancing binding protein beta deletion in mice attenuates inflammation, endoplasmic reticulum stress, and lipid accumulation in diet-induced nonalcoholic steatohepatitis. Hepatology. 2007;45;1108-1117. Rinella ME, Siddiqui MS, Gardikiotes K, Gottstein J, Elias M, Green RM. Dysregulation of the unfolded protein response in db/db mice with diet-induced steatohepatitis. Hepatology. 2011;54;1600-1609. Soon RK, Yan JS, Grenert JP, Maher JJ. Stress signaling in the methionine-choline-deficient model of murine fatty liver disease. Gastroenterology. 2010;139;1730-1739. Garbow JR, Doherty JM, Schugar RC, et al. Hepatic steatosis, inflammation, and ER stress in mice maintained long term on a very low-carbohydrate ketogenic diet. Am J Physiol Gastrointest Liver Physiol. 2011;300;G956-G967. Fu S, Yang L, Li P, et al. Aberrant lipid metabolism disrupts calcium homeostasis causing liver endoplasmic reticulum stress in obesity. Nature. 2011;473;528-531. Ozcan U, Yilmaz E, Ozcan L, et al. Chemical chaperones reduce ER stress and restore glucose homeostasis in a mouse model of type 2 diabetes. Science. 2006;313;1137-1140. Adams LA, Angulo P, Petz J, Keach J, Lindor KD. A pilot trial of high-dose ursodeoxycholic acid in nonalcoholic steatohepatitis. Hepatol Int. 2010;4;628-633. Leuschner UF, Lindenthal B, Herrmann G, et al. High-dose ursodeoxycholic acid therapy for nonalcoholic steatohepatitis: a double-blind, randomized, placebo-controlled trial. Hepatology. 2010;52;472-479. Sanyal AJ, Campbell-Sargent C, Mirshahi F, et al. Nonalcoholic steatohepatitis: association of insulin resistance and mitochondrial abnormalities. Gastroenterology. 2001;120;1183-1192. Caldwell SH, de Freitas LA, Park SH, et al. Intramitochondrial crystalline inclusions in nonalcoholic steatohepatitis. Hepatology. 2009;49;1888-1895. Cortez-Pinto H, Chatham J, Chacko VP, Arnold C, Rashid A, Diehl AM. Alterations in liver ATP homeostasis in human nonalcoholic steatohepatitis: a pilot study. JAMA. 1999;282;1659-1664. Pessayre D. Role of mitochondria in non-alcoholic fatty liver disease. J Gastroenterol Hepatol. 2007;22;S20-S27. Rashid A, Wu TC, Huang CC, et al. Mitochondrial proteins that regulate apoptosis and necrosis are induced in mouse fatty liver. Hepatology. 1999;29;1131-1138. Arsov T, Larter CZ, Nolan CJ, et al. Adaptive failure to high-fat diet characterizes steatohepatitis in Alms1 mutant mice. Biochem Biophys Res Commun. 2006;342;1152-1159. Llacuna L, Fern?ndez A, Montfort CV, et al. Targeting cholesterol at different levels in the mevalonate pathway protects fatty liver against ischemia-reperfusion injury. J Hepatol. 2011;54;1002-1010. Lemasters JJ, Theruvath TP, Zhong Z, Nieminen AL. Mitochondrial calcium and the permeability transition in cell death. Biochim Biophys Acta. 2009;1787;1395-1401. Levine B, Kroemer G. Autophagy in the pathogenesis of disease. Cell. 2008;132;27-42. Green DR, Galluzzi L, Kroemer G. Mitochondria and the autophagy-inflammation-cell death axis in organismal aging. Science. 2011;333;1109-1112. Nakahira K, Haspel JA, Rathinam VA, et al. Autophagy proteins regulate innate immune responses by inhibiting the release of mitochondrial DNA mediated by the NALP3 inflammasome. Nat Immunol. 2011;12;222-230. Czaja MJ. Functions of autophagy in hepatic and pancreatic physiology and disease. Gastroenterology. 2011;140;1895-1908. Kono H, Rock KL. How dying cells alert the immune system to danger. Nat Rev Immunol. 2008;8;279-289. Yang L, Li P, Fu S, Calay ES, Hotamisligil GS. Defective hepatic autophagy in obesity promotes ER stress and causes insulin resistance. Cell Metab. 2010;11;467-478. Davis BK, Wen H, Ting JP. The inflammasome NLRs in immunity, inflammation, and associated diseases. Annu Rev Immunol. 2011;29;707-735. Wen H, Gris D, Lei Y, et al. Fatty acid-induced NLRP3-ASC inflammasome activation interferes with insulin signaling. Nat Immunol. 2011;12;408-415. Csak T, Ganz M, Pespisa J, Kodys K, Dolganiuc A, Szabo G. Fatty acid and endotoxin activate inflammasomes in mouse hepatocytes that release danger signals to stimulate immune cells. Hepatology. 2011;54;133-144. Kirovski G, G?bele E, Dorn C, et al. Hepatic steatosis causes induction of the chemokine RANTES in the absence of significant hepatic inflammation. Int J Clin Exp Pathol. 2010;3;675-680. Richardson MM, Jonsson JR, Powell EE, et al. Progressive fibrosis in nonalcoholic steatohepatitis: association with altered regeneration and a ductular reaction. Gastroenterology. 2007;133;80-90. Grzelak CA, Martellotto LG, Warner FJ, et al. The hedgehog pathway in hepatocellular liver injury progression. J Gastroenterol Hepatol. 2011;26;13-14. Rangwala F, Guy CD, Lu J, et al. Increased production of sonic hedgehog by ballooned hepatocytes. J Pathol. 2011;224;401-410. Philips GM, Chan IS, Swiderska M, et al. Hedgehog signaling antagonist promotes regression of both liver fibrosis and hepatocellular carcinoma in a murine model of primary liver cancer. PLoS One. 2011;6;e23943. Caldwell S, Ikura Y, Dias D, et al. Hepatocellular ballooning in NASH. J Hepatol. 2010;53;719-723. Lackner C, Gogg-Kamerer M, Zatloukal K, Stumptner C, Brunt EM, Denk H. Ballooned hepatocytes in steatohepatitis: the value of keratin immunohistochemistry for diagnosis. J Hepatol. 2008;48;821-828. Caldwell SH, Redick JA, Chang CY, Davis CA, Argo CK, Al Osaimi KA. Enlarged hepatocytes in NAFLD examined with osmium fixation: does microsteatosis underlie cellular ballooning in NASH. Am J Gastroenterol. 2006;101;1677-1678. Machado MV, Cortez-Pinto H. Cell death and nonalcoholic steatohepatitis: where is ballooning relevant?. Expert Rev Gastroenterol Hepatol. 2011;5;213-222. Wieckowska A, Zein NN, Yerian LM, Lopez AR, McCullough AJ, Feldstein AE. In vivo assessment of liver cell apoptosis as a novel biomarker of disease severity in nonalcoholic fatty liver disease. Hepatology. 2006;44;27-33. Joka D, Wahl K, Moeller S, et al. Prospective biopsy-controlled evaluation of cell death biomarkers for prediction of liver fibrosis and nonalcoholic steatohepatitis. Hepatology. 2012;55;455-464. Salminen A, Kaarniranta K. Control of p53 and NF-kappaB signaling by WIP1 and MIF: role in cellular senescence and organismal aging. Cell Signal. 2011;23;747-752. Ren JL, Pan JS, Lu YP, Sun P, Han J. Inflammatory signaling and cellular senescence. Cell Signal. 2009;21;378-383. Hartmann D, Srivastava U, Thaler M, et al. Telomerase gene mutations are associated with cirrhosis formation. Hepatology. 2011;53;1608-1617. Xue W, Zender L, Miething C, et al. Senescence and tumour clearance is triggered by p53 restoration in murine liver carcinomas. Nature. 2007;445;656-660. Farrell GC, Larter CZ, Hou JY, et al. Apoptosis in experimental NASH is associated with p53 activation and TRAIL receptor expression. J Gastroenterol Hepatol. 2009;24;443-452. Dela Pe?a A, Leclercq IA, Williams J, Farrell GC. NADPH oxidase is not an essential mediator of oxidative stress or liver injury in murine MCD diet-induced steatohepatitis. J Hepatol. 2007;46;304-313. Videla LA, Tapia G, Rodrigo R, et al. Liver NF-kappaB and AP-1 DNA binding in obese patients. Obesity (Silver Spring). 2009;17;973-979. Leclercq IA, Farrell GC, Sempoux C, dela Pe?a A, Horsmans Y. Curcumin inhibits NF-kappaB activation and reduces the severity of experimental steatohepatitis in mice. J Hepatol. 2004;41;926-934. Koca SS, Bahcecioglu IH, Poyrazoglu OK, Ozercan IH, Sahin K, Ustundag B. The treatment with antibody of TNF-alpha reduces the inflammation, necrosis and fibrosis in the non-alcoholic steatohepatitis induced by methionine- and choline-deficient diet. Inflammation. 2008;31;91-98. Tomita K, Tamiya G, Ando S, et al. Tumour necrosis factor alpha signalling through activation of Kupffer cells plays an essential role in liver fibrosis of non-alcoholic steatohepatitis in mice. Gut. 2006;55;415-424. Li L, Chen L, Hu L, et al. Nuclear factor high-mobility group box1 mediating the activation of Toll-like receptor 4 signaling in hepatocytes in the early stage of nonalcoholic fatty liver disease in mice. Hepatology. 2011;54;1620-1630. Miura K, Kodama Y, Inokuchi S, et al. Toll-like receptor 9 promotes steatohepatitis by induction of interleukin-1beta in mice. Gastroenterology. 2010;139;323-334. Brenner DA, Seki E, Taura K, et al. Non-alcoholic steatohepatitis-induced fibrosis: Toll-like receptors, reactive oxygen species and Jun N-terminal kinase. Hepatol Res. 2011;41;683-686. Schattenberg JM, Singh R, Wang Y, et al. JNK1 but not JNK2 promotes the development of steatohepatitis in mice. Hepatology. 2006;43;163-172. Wang Y, Ausman LM, Russell RM, Greenberg AS, Wang XD. Increased apoptosis in high-fat diet-induced nonalcoholic steatohepatitis in rats is associated with c-Jun NH2-terminal kinase activation and elevated proapoptotic Bax. J Nutr. 2008;138;1866-1871. Larter CZ, Yeh MM, Haigh WG, et al. Hepatic free fatty acids accumulate in experimental steatohepatitis: role of adaptive pathways. J Hepatol. 2008;48;638-647. Larter CZ, Yeh MM, Van Rooyen DM, Brooling J, Ghatora K, Farrell GC. Peroxisome proliferator-activated receptor-alpha agonist, Wy 14,643, improves metabolic indices, steatosis and ballooning in diabetic mice with non-alcoholic steatohepatitis. J Gastroenterol Hepatol. 2012;27;341-350. Ferreira DM, Castro RE, Machado MV, et al. Apoptosis and insulin resistance in liver and peripheral tissues of morbidly obese patients is associated with different stages of non-alcoholic fatty liver disease. Diabetologia. 2011;54;1788-1798. Malhi H, Bronk SF, Werneburg NW, Gores GJ. Free fatty acids induce JNK-dependent hepatocyte lipoapoptosis. J Biol Chem. 2006;281;12093-12101. Matzinger P. Tolerance, danger, and the extended family. Annu Rev Immunol. 1994;12;991-1045. Gallucci S, Lolkema M, Matzinger P. Natural adjuvants: endogenous activators of dendritic cells. Nat Med. 1999;5;1249-1255. Zhang Q, Raoof M, Chen Y, et al. Circulating mitochondrial DAMPs cause inflammatory responses to injury. Nature. 2010;464;104-107. Bianchi ME. HMGB1 loves company. J Leukoc Biol. 2009;86;573-576. Rivera CA, Adegboyega P, van Rooijen N, Tagalicud A, Allman M, Wallace M. Toll-like receptor-4 signaling and Kupffer cells play pivotal roles in the pathogenesis of non-alcoholic steatohepatitis. J Hepatol. 2007;47;571-579. Ellett JD, Evans ZP, Atkinson C, Schmidt MG, Schnellmann RG, Chavin KD. Toll-like receptor 4 is a key mediator of murine steatotic liver warm ischemia/reperfusion injury. Liver Transpl. 2009;15;1101-1109. Arumugam TV, Okun E, Tang SC, Thundyil J, Taylor SM, Woodruff TM. Toll-like receptors in ischemia-reperfusion injury. Shock. 2009;32;4-16. Szabo G, Velayudham A, Romics L, Mandrekar P. Modulation of non-alcoholic steatohepatitis by pattern recognition receptors in mice: the role of toll-like receptors 2 and 4. Alcohol Clin Exp Res. 2005;29;140S-145S. Spruss A, Kanuri G, Wagnerberger S, Haub S, Bischoff SC, Bergheim I. Toll-like receptor 4 is involved in the development of fructose-induced hepatic steatosis in mice. Hepatology. 2009;50;1094-1104. Shi H, Kokoeva MV, Inouye K, Tzameli I, Yin H, Flier JS. TLR4 links innate immunity and fatty acid-induced insulin resistance. J Clin Invest. 2006;116;3015-3025. K?nner AC, Br?ning JC. Toll-like receptors: linking inflammation to metabolism. Trends Endocrinol Metab. 2011;22;16-23. Fessler MB, Rudel LL, Brown JM. Toll-like receptor signaling links dietary fatty acids to the metabolic syndrome. Curr Opin Lipidol. 2009;20;379-385. Csak T, Velayudham A, Hritz I, et al. Deficiency in myeloid differentiation factor-2 and toll-like receptor 4 expression attenuates nonalcoholic steatohepatitis and fibrosis in mice. Am J Physiol Gastrointest Liver Physiol. 2011;300;G433-G441. De Nardo D, De Nardo CM, Nguyen T, Hamilton JA, Scholz GM. Signaling crosstalk during sequential TLR4 and TLR9 activation amplifies the inflammatory response of mouse macrophages. J Immunol. 2009;183;8110-8118. Vijay-Kumar M, Aitken JD, Carvalho FA, et al. Metabolic syndrome and altered gut microbiota in mice lacking Toll-like receptor 5. Science. 2010;328;228-231. Bilzer M, Roggel F, Gerbes AL. Role of Kupffer cells in host defense and liver disease. Liver Int. 2006;26;1175-1186. Canbay A, Feldstein AE, Higuchi H, et al. Kupffer cell engulfment of apoptotic bodies stimulates death ligand and cytokine expression. Hepatology. 2003;38;1188-1198. Stienstra R, Saudale F, Duval C, et al. Kupffer cells promote hepatic steatosis via interleukin-1beta-dependent suppression of peroxisome proliferator-activated receptor alpha activity. Hepatology. 2010;51;511-522. Listenberger LL, Han X, Lewis SE, et al. Triglyceride accumulation protects against fatty acid-induced lipotoxicity. Proc Natl Acad Sci U S A. 2003;100;3077-3082. Yamaguchi K, Yang L, McCall S, et al. Inhibiting triglyceride synthesis improves hepatic steatosis but exacerbates liver damage and fibrosis in obese mice with nonalcoholic steatohepatitis. Hepatology. 2007;45;1366-1374. Brown MS, Goldstein JL. Selective versus total insulin resistance: a pathogenic paradox. Cell Metab. 2008;7;95-96. WHAT ARE THE ORIGINS OF LIVER INFLAMMATION IN NASH?